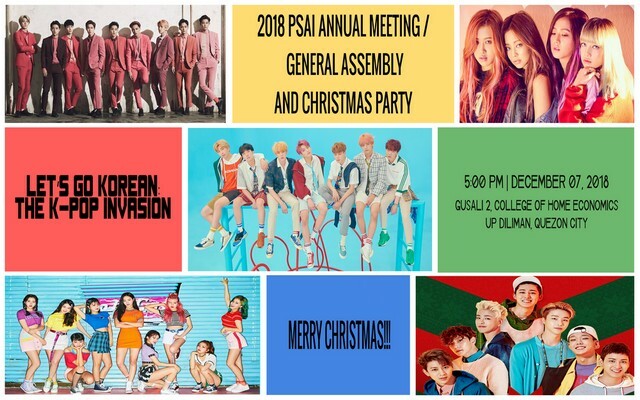 We are pleased to invite you and colleagues in your institution to the PSAI 2018 Annual Meeting/General Assembly and Christmas Party which will be held on Friday, December 7, 2018 from 5:00 to 9:00 p.m. at the Gusali 2, College of Home Economics, Regidor Street, University of the Philippines Diliman, Quezon City. Attached is a vicinity map for your reference. In keeping with the times, we have decided to adopt for this year’s celebration the theme Let’s Go Korean: The K-Pop Invasion because we believe that as a professional association, we should always take account of what may be of interest to our members who are practitioners/professionals from various generations, notably, the proverbial millennials, generations x, y z, in our midst, not to mention our student affiliates, and our usual corps of members who continue to keep alive the spirit of oneness in our association. We therefore exhort our members and guests to come in your best Korean get-up and to participate in our activities. Special prize awaits the Best Group Performance and the K-Pop of the night. Attached is a brief description and a draft Program of Activities to apprise you of what to expect in our year-end get together. We shall also confer honors/recognitions to those who continue to be an inspiration to the PSAI and to the Statistics community. We therefore encourage one and all to come and to join us in our year-end festivities. This will also enable our PSAI officers to update you on what have been accomplished for 2018. We shall also elect new members of the Board of Directors who will serve for a term of three years (2019-2021). We know you will understand that to make this event possible we have to make nominal adjustments on our registration fee at P350, for either PSAI member or non-member guest. For inquiries and confirmation of attendance, please contact PSAI Secretariat Ms. Stephanie Rae C. Andres or Mr. Jeffrey B. Sumalinog at 920-6513 or 456-1928 or email psai.secretariat@gmail.com. We look forward to your presence and your active participation, and let us celebrate our oneness as a professional association!